This Vespa is fully restoration. Rebuild engine with brand new parts. The body is rust free, straight body, has been stripped down sanded to bare metal and repainted in Black doff color. It can run up to 55mph without sidecar, and below 40 mph (safety recommended) with passenger on sidecar. Manual hand twists 4-speed transmission. 150 cc two-stroke engine. Gasoline mixed with 2% oil. The sidecar can be detached from the scooter. To remove it, you must replace the center bolt engine mounting, remove the sidecar framework and center stand, with the original vespa center bolt engine mounting. We will give you on our package for free already included spare spark plug, oil bottle mixer, tool kits and center bolt engine mounting. Buyer will be responsible for shipping. I would love to help for crating, handling and shipping. Shipping would cost you approximately around $700 - $770 plus professional crating US$120 to your nearest port or your nearest state warehouse. It would be taking about 4 until 6 weeks for shipping to USA and Canada. The buyer will have to pay approximately $140 to $190 for associated arrival fees when you pick it up at your preferred port/warehouse for arrival. Please email me for shipping price detail or crating sample pictures (www.scooter99.com)! 50% of total payment must be made 6 working days after the auction ends (non refundable). Within that time we will send you quotation for shipping and photos of crating via e-mail. 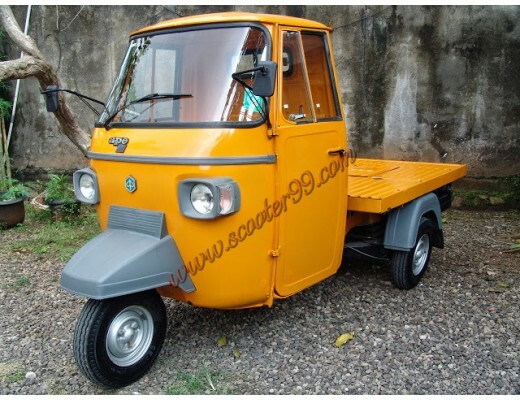 Scooter will be delivered as soon as we received the 50%. After full payment has been received, we will express mail original Bill of Lading, for custom clearance, and Title Book, for registration. You will have to settle the rest of the payment after the original Bill of Lading is ready. Therefore there is still time for the transfer to go through and to express mail the original Bill of Lading and Title Book. Before you bid please kindly read understand the description and committed to finish the transaction. If you have any question, please don't hesitate to email me.